Life, et al. : Three New Orders of Insecta in Burmese Amber: is this Really Necessary? Three New Orders of Insecta in Burmese Amber: is this Really Necessary? For the past two decades, the amber deposits of the Hukawng Valley in Myanmar's Kachin State have been intensely scrutinized by paleoentomologists. 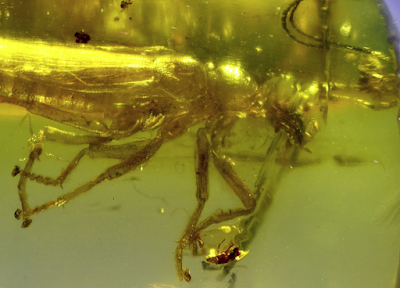 The burmite recovered from this locale dates to the very end of the Cenomanian Stage (98.79 mya; Shi et al., 2012). Containing everything from what is by far the oldest known specimen of the flagrantly obscure arachnid order Palpigradi (largely the same as its modern counterparts; Engel et al., 2016) to uniquely specialized haidomyrmecine ants (weirdly unlike any of their modern counterparts; Perrichot et al., 2016), it is a treasure trove of exquisite Cretaceous microfaunal data. Just within the past year and a half, three (count 'em, three) new insect orders have been described from Hukawng Valley burmite: namely, the Alienoptera (Bai et al., 2017), Aethiocarenodea (Poinar & Brown, 2017), and Tarachoptera (Mey et al., 2017). (And this is not even to mention the Permopsocida, an order that was established for Permian-Cretaceous insect taxa after the description of a specimen from the Hukawng Valley; Huang et al., 2016). After we pick our collective mandibles up off the floor, we should consider each of these taxa in turn: are their ordinal statuses truly defensible? Or, perhaps, are these better regarded as stem-groups of extant taxa? First off, the Tarachoptera. This order consists of two genera, both placed in the Tarachocelidae. This peculiar family is clearly a member of the superorder Amphiesmenoptera, a clade consisting of the extant orders Lepidoptera (moths, and the diurnal moths we call "butterflies") and Trichoptera (caddisflies); of the 14 autapomorphic* amphiesmenopteran characters listed by Kristensen (1984) that are applicable to adult amber inclusions, only 3 are incontrovertibly absent from the Tarachocelidae (for what it's worth, paired setose pronotal warts, setose sclerites below or behind the metathoracic subalare†, and rod-like apodemes‡ on the eighth and ninth female abdominal segments; Mey et al., 2017). However, the unassuming, mandibulate-moth-like tarachocelids cannot be placed in either extant order of the Amphiesmenoptera. They possess scales on their wings, reminding one of the Lepidoptera; but this resemblance appears to be a superficial convergence, as some trichopterans have developed scale independently of their origin in the Lepidoptera (Huxley & Barnard, 1988)—meaning that it is plausible that scales could emerge independently as well in the Tarachocelidae (Mey et al., 2017). Conversely, the specialized haustellum (proboscis) and single nygma on the forewing characteristic of the Trichoptera are conspicuously lacking in all examined tarachocelid specimens (Mey et al., 2017). In short, not only can the Tarachocelidae not be placed in any extant order, but they also cannot be incontrovertibly judged more closely related to either of the extant amphiesmenopteran orders than to the other. 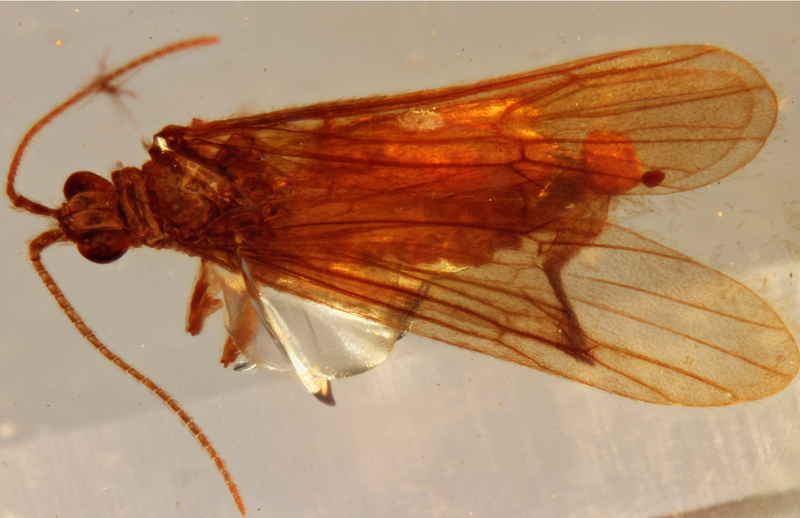 One could say that the Tarachoptera are like what the most primitive Amphiesmenoptera would have been, were it not for some peculiar derived traits of their own: among these are vestigial maxillary palpi (quite unlike the functional examples in the basalmost moths and caddisflies—see above); a single medial wing vein (otherwise known from insects only in the monotypic glossatan moth family Aenigmatineidae, thus far described only from Australia's Kangaroo Island; Kristensen et al., 2014); and the absence of tibial spurs, which with the exception of a few odd lepidopterans are a universal feature of insects with complete metamorphosis. Since tibial spurs are involved in launching adult insects into flight (Burrows & Durosenko, 2015), tarachocelids' lack of them suggests that their flying capability was limited. While eccentric autapomorphies juxtaposed with basal traits amount to a syndrome typical of stem-groups all across the tree of life, the fact that one cannot argue that Tarachocelidae is more closely akin to either the Trichoptera or Lepidoptera leads me to agree that one could parsimoniously grant the Tarachoptera ordinal rank. However, whether this is necessary is another question. Unlike the Tarachoptera, the Aethiocarenodea were described based on a single species, Aethiocarenus burmanicus. A. burmanicus is known from a single adult female specimen, and is like nothing else on Earth: a small, wingless, flattened insect, with a narrow corpus and a triangular head with its hypotenuse situated opposite to its articulation with the thorax—a condition quite unlike the head of any other insect, extant or otherwise. The head is strongly hypognathous§ (see below), making for a distinctive profile. Adding an additional memorable trait to this already memorable habitus, a pair of apparently secretory glands were situated on the back of the neck (presumably defensive in function) (Poinar & Brown, 2017). 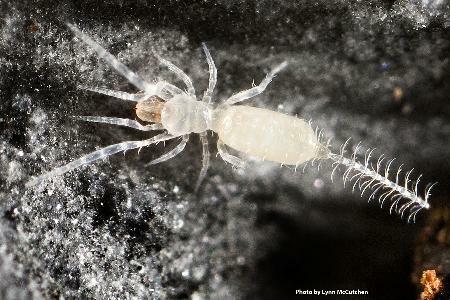 What do we make of this creature, taxonomically speaking? Very little, judging from Poinar & Brown (2017), who do not speculate on its phylogeny nor even bother to assign it provisionally to any subdivision of the Insecta. The presence of cerci would exclude it from the clade Acercaria (Hemiptera, Psocodea, etc. ; Huang et al., 2016) and from those insect superorders that practice complete metamorphosis (e.g., the Amphiesmenoptera), leaving the only possible assignment for the Aethiocarenodea as the Polyneoptera. This assemblage may or may not be monophyletic (Beutel et al., 2013), and there is little basis for direct comparison of the Aethiocarenodea with its fellow members; all fourth tarsomeres extend distally beneath the respective fifth tarsomeres, which Poinar & Brown (2017) note vaguely recalls the tarsal condition of some Dermaptera (earwigs). We thus remain at a loss for valid comparisons to situate the Aethiocarenodea in the insect family tree. However, as argued by Christopher Taylor (rather more eloquently than I could put it), this does not necessarily warrant ordinal status: to place A. burmanicus in its own order is more an admission of ignorance than anything else. By contrast, the (again monotypic) Alienoptera are clearly akin to mantises (Mantodea). Described from a single male specimen of Alienopterus brachyelytrus (Bai et al., 2016), the taxon is a creature with a triangular head and bristly profemora not unlike those of the most ancient mantids. While most of the features that define the Dictyoptera (cockroaches, termites, and mantises) cannot be falsified on the specimen of A. brachyelytrus, the presence of a profemoral brush (otherwise unique to the Mantodea) and excellently preserved genitalia clinch its classification therein. The Alienoptera can be distinguished from the Mantodea mainly on the basis of two peculiar characters: greatly shortened, sclerotized forewings analogous to those for which the Dermaptera are named, and utterly unlike anything observed in any Mantodea; and enlarged arolia|| reminiscent of those exhibited by the rockcrawlers (Mantophasmatodea) (Beutel & Gorb, 2008). Mantises, conversely, lack arolia (with the possible exception of the extinct Santanmantis). 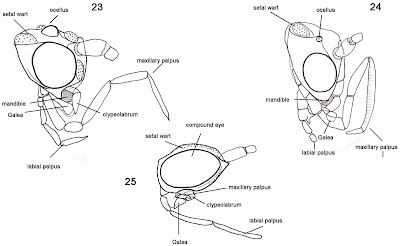 More conspicuously, the Alienoptera do not have the raptorial forelegs for which all mantises living and extinct are known (Wieland, 2013); the vestiture of the profemora would not have worked in opposition to tibial spines as it would in mantises' case. Most of these traits are "retained ancestral conditions", since the ancestral dictyopteran presumably also lacked protibial spines and retained arolia; the "array of specialized [alienopteran] features" (autapomorphies, to use phylogenetic jargon) consist only of a saddle-shaped pronotum and earwig-like tegmina. Bai et al. (2016) exclude the species from the Mantodea proper, and reasonably so, but does this justify erecting a new order for the taxon? In my opinion, no. To begin with, a strict consensus tree using 58 morphological characters firmly placed Al. brachyelytrus as the sister group to the Mantodea (Bai et al., 2016). Even the 30% of this male specimen's genitalia that is visible, a suite of body parts that Bai et al. (2016) duly note have evolutionary plasticity to a degree that they may differ even within the same order (Klass, 1997), "fully conform to the condition within" mantises. Moreover, the characters that exclude Al. brachyelytrus from the Mantodea are mostly "retained ancestral conditions", making this mantodean sister-group not a mantis by dint of lacking derived mantodean traits. Al. brachelytrus is as such not excluded from the Mantodea because it has closer kin elsewhere, but because it lacks some (but not all) of the derived traits that define that order: the status of the Alienoptera is thus contingent upon how broadly one wishes to spread the definition of the Mantodea. The bounds of that definition—where a basal dictyopteran more closely related to mantises than to any other extant taxon becomes itself a "mantis"—are subjective. For comparison, consider the cockroach family Cryptocercidae. Being subsocial wood-feeders dependent upon oxymonadids and hypermastigids in their hindguts for cellulose digestion, these cockroaches bear an obvious biological and morphological resemblance to termites, and are regarded as the sister-group of the infraorder Isoptera (Engel et al., 2009). With the exception of adult winglessness (an apomorphy¶), the features that distinguish the Cryptocercidae from termites are basal conditions with respect to the Isoptera: e.g., an ootheca (egg-case; vestigial or absent in termites). One could simply say, therefore, that cryptocercids are stem-group termites: we only call them "cockroaches" due to the convenience of that term. Likewise, one can either refer to Alienoptera as a mantodean stem-group, or as its own order. Arguably, neither position is "false", and so ordinal ranking is a matter of preference: of whether one chooses to lump or to split. And I, personally, would advocate that personal preference does not a new order make. On a tangent, given the clear anatomical gulf between cryptocercids and even the most basal known termite (Cratomastotermes wolfschwenningeri, a mid-Cretaceous Brazilian specimen classified in its own family; Engel et al, 2009), one could argue that an analogy between this systematic situation and that of the Alienoptera with respect to the Mantodea is stretching things a bit. However, given that the ancestral ethological condition of the Mantodea was that of prowlers on or under bark (Wieland, 2010; the metallyticid shown retains this basal niche), unlike the clearly foliage-abiding Al. brachyelytrus (Bai et al., 2016), there certainly was an ecological distinction between that insect and contemporary mantises. In conclusion, I think that of the Alienoptera, Aethiocarenodea, and Tarachoptera, only the latter order is truly deserving of that rank, given the information now available. However, I admit that further data could lend support to the Aethiocarenodea: I think that a comprehensive search of other Cretaceous ambers for kin to this enigmatic little creature is in order. *A derived trait unique to a particular taxon. 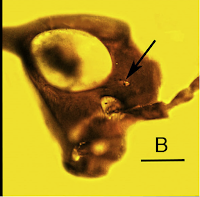 †A sclerite immediately adjacent to the base of the insect wing, providing a place of attachment to the pleural wing muscle. ‡Ingrowths of the exoskeleton, serving as attachments for muscles. ||An unsegmented lobe extending from the tip of the insect tarsus, situated between the tarsal claws. ¶A derived trait (with reference to its ancestral state) in a particular taxon, but not one necessarily unique to that taxon. Bai, M.; Beutel, R. G.; Klass, K.-D.; Zhang, W.; Yang, X.; and Wipfler, B. (2016). 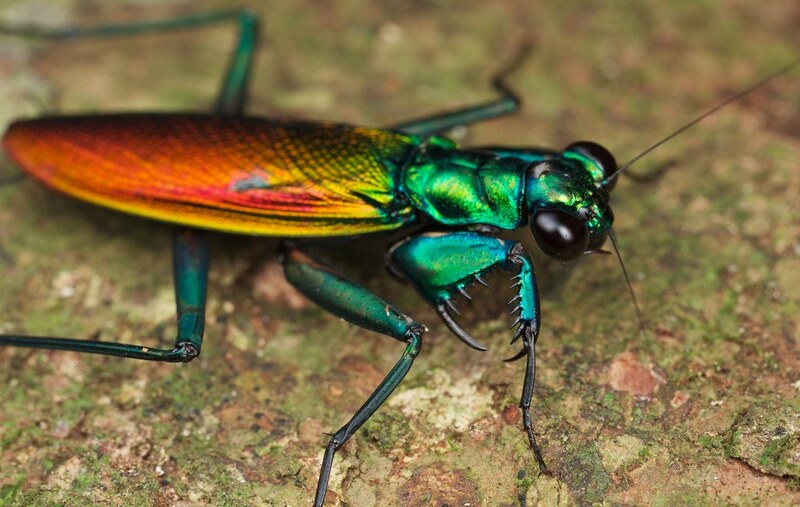 Alienoptera — a new insect order in the roach–mantodean twilight zone. Gondwana Research, 39, 317-326. Beutel, R. G.; Wipfler, B.; Gottardo, M.; and Dallai, R. (2013). Polyneoptera or "lower Neoptera" - new light on old and difficult phylogenetic problems. 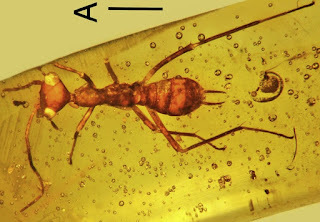 Atti Academia Nazionale Italiana di Entomologia, Anno LXI, 2013: 133-142. Burrows, M. and Dorosenko, M. (2015). Jumping mechanism and strategies in moths (Lepidoptera). Journal of Experimental Biology, 218, 265-266. Engel, M. S.; Breitkreuz, L. C.; Cai, C.; Alvarado, M.; Azar, D.; and Huang, D. (2016). 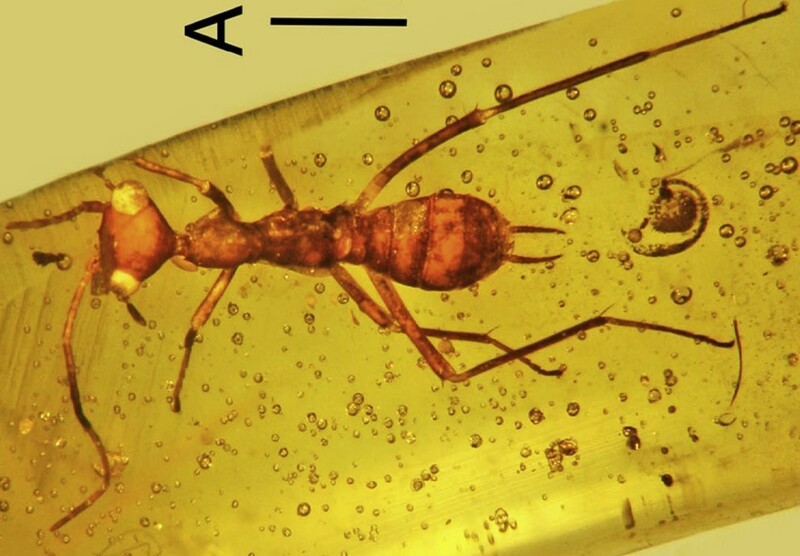 The first Mesozoic microwhip scorpion (Palpigradi): a new genus and species in mid-Cretaceous amber from Myanmar. Naturwissenschaften, 103(3-4), 19. doi: 10.1007/s00114-016-1345-4. Huxley, J. and Barnard, P. C. (1988). 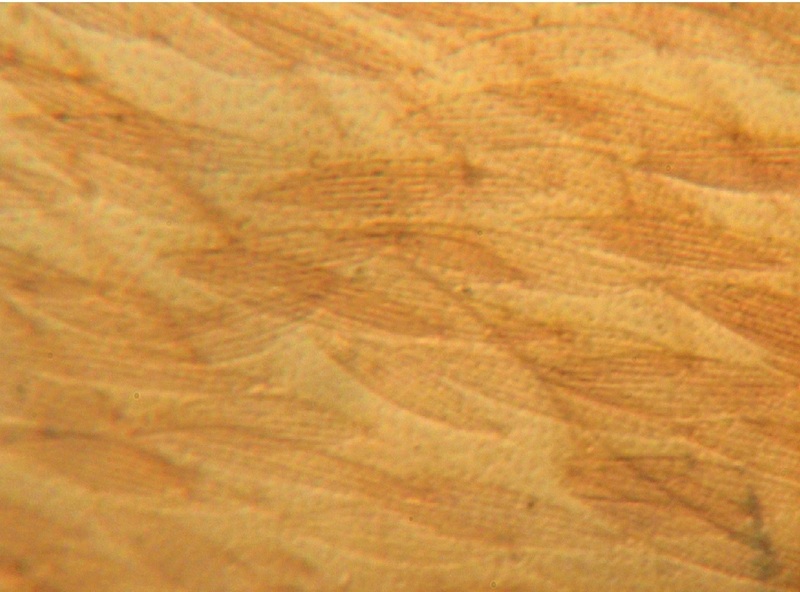 Wing scales of Pseudoleptocerus chirindensis Kimmins (Trichoptera: Leptoceridae). Zoological Journal of the Linnean Society, 92, 285-312. Klass, K.-D. (1997). 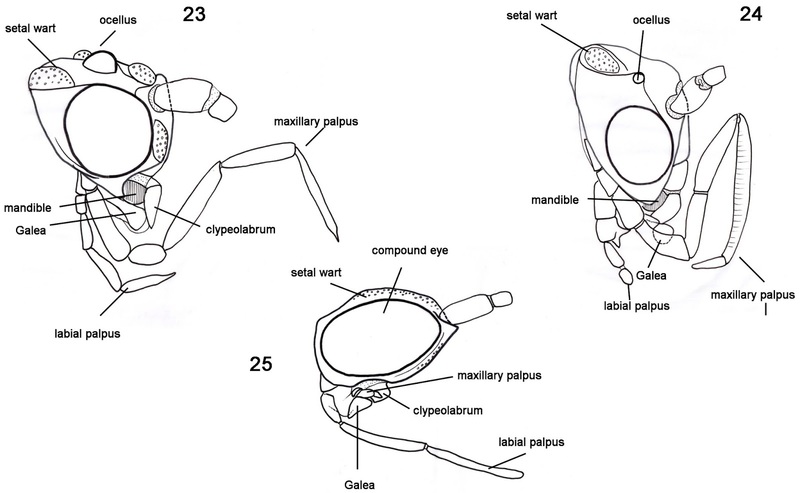 The external male genitalia and the phylogeny of Mantodea and Blattaria. Bonner Zoologische Monographien, 42, 1-341. Kristensen, N. P. (1984). Studies on the morphology and systematics of primitive Lepidoptera (Insecta). Steenstrupia, 10, 141-191. Kristensen, N. P.; Hilton, D. J., Kallies, A.; Milla, L.; Rota, J.; Wahlberg, N.; Wilcox, S. A.; Glatz, R. V.; Young, D. A.; Cocking, G.; Edwards, T.; Gibbs, G. W.; and Halsey, M. (2014). A new extant family of primitive moths from Kangaroo Island, Australia, and its significance for understanding early Lepidoptera evolution. Systematic Entomology, 40, 5-16. Wieland, F. (2010). The Phylogenetic System of the Mantodea (Insecta: Dictyoptera) (unpublished dissertation). Georg-August-Universität, Göttingen. Wieland, F. (2013). The Phylogenetic System of the Mantodea (Insecta: Dictyoptera). Species, Phylogeny & Evolution; 3, 3-222.